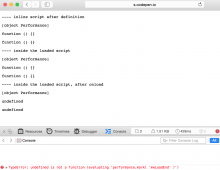 When using Safari, often when logged-in and loading the edit page (or viewing articles) this error shows up in the console. It is more often triggered on the first page load after localStorage.clear();. 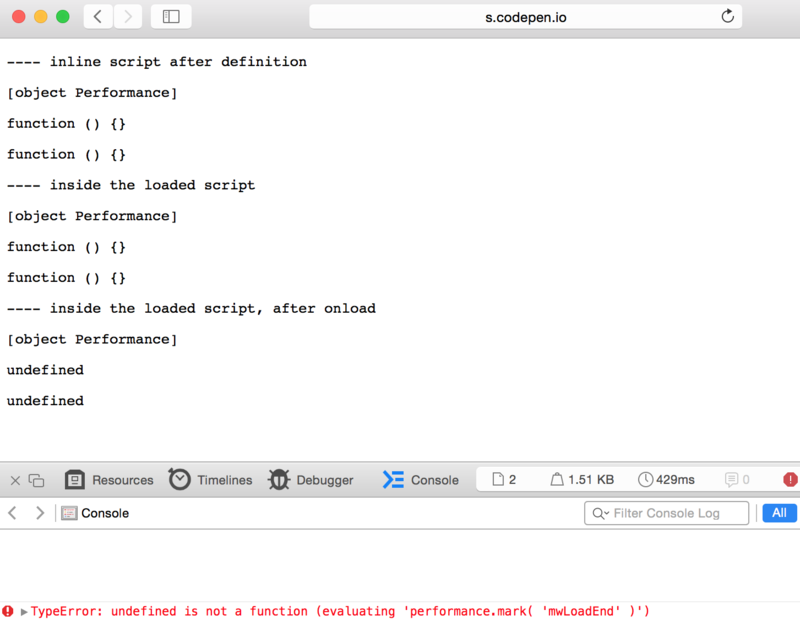 The oddest part is that when this error happens, even way after the page is loaded, manually checking the performance global, it still shows performance.mark as undefined. So it's not a race condition, it's permanently gone. However it's defined in the startup module. There is no way it can't run. And there is no error for performance.mark('mwLoadStart');, only for performance.mark('mwLoadEnd');. 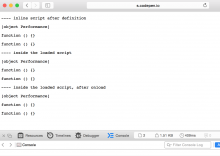 Krinkle added projects: Performance-Team, MediaWiki-ResourceLoader, Regression. Krinkle added subscribers: Krinkle, ori, TheDJ. 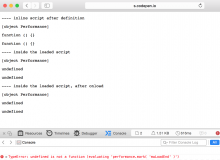 From the meeting discussion, it seems like the safest approach is to wrap performance.mark in a function that checks the existence of the native function at call time. 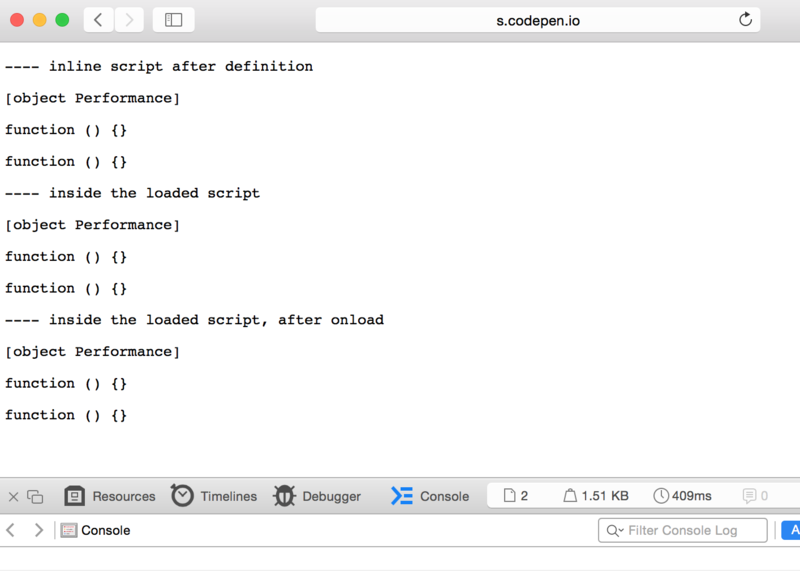 It might be worth reporting back with EL when it's missing, to check if there are more browsers than Safari displaying that suspect behavior of sometimes not having the property defined. 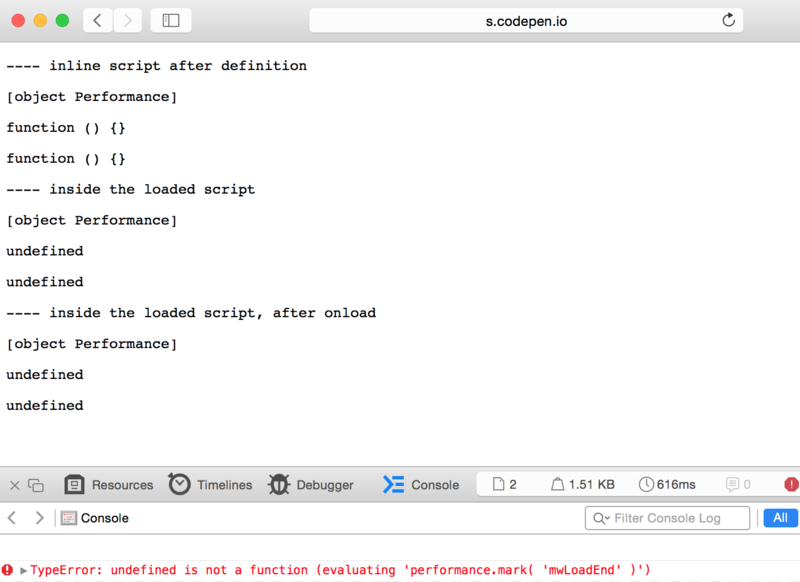 Conditionally defines performance, conditionally defines performance.mark, uses DOM methods to create a script element to load a second file. Looks for window.performance, window.performance.mark and performance.mark. When opened in Chrome it works fine. Opened in Safari, sometimes all three checkpoints work. Sometimes only the first. Sometimes only the first two. Properties randomly disappear, at random times.